GameCraft Miniatures wants you to be able to transport and store your vehicles safely and effectively and they think they've made the perfect tray for the job. Our Tank Transports hold many more vehicles than our competition's at a cost considerably less per vehicle and our Tank Transports have enough vertical space to insure that you do not crush your antenna, radar dishes, machine guns, etc. 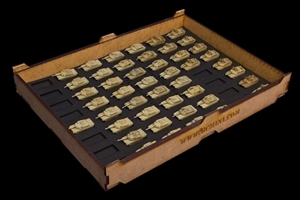 These tank transports also allow you to show off your collection in an attractive case. Stack as many Tank Transports as you like and carry then as one sturdy unit. In this kit you will receive the tank transport and two pieces of blank foam so you can make your own cut outs for your vehicles.